Big news out of Aspen. Green Mountain Coffee Roasters (stock symbol GMCR) has been chosen as the official coffee of Aspen Spin. Check out their web-site at www.GreenMountainCoffee.com. Green Mountain also provides free coffee every morning at the base of all four mountains here in Aspen. As the official coffee of Aspen Spin, Green Mountain, which is based in Vermont, helps us to start our engine each day. Aspen Spin looks forward to a mutually beneficial partnership with Green Mountain Coffee. Give it a try, you'll quit drinking Four-bucks, oops we meant Starbucks. Actually in Aspen it's Six-bucks anyway. 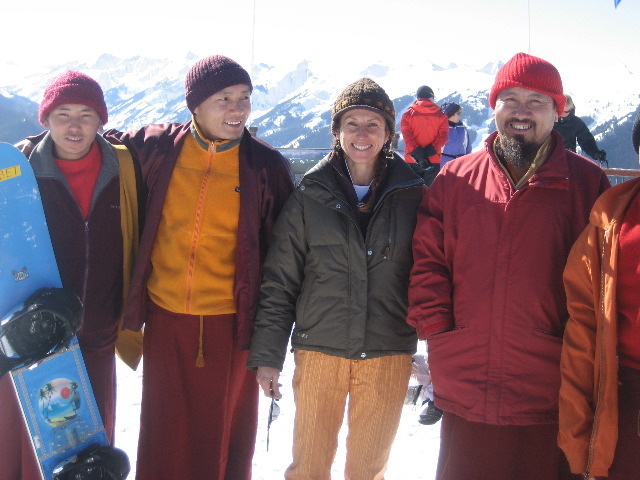 It has nothing to do with coffee, but the picture below shows international surfing star Diane Kessler and a group of Bhutanese Monks on top of Aspen Mountain. Kessler is a high scoring forward on Euro-Trash, the Aspen Recreational Hockey League's defending champs.